The number of people who are looking for as many ways to save money as possible is increasing. Yet, most of these people continue to use the same credit card they have had for years. Many times, switching to a new credit card can enable them to save as much as possible based on the amount of money they’re spending each month and how they’re spending the money. When a person is looking for the best credit card canada 2015, they’re going to want to look at the category that fits their spending habits. The top two cards that offer cash back are the MBNA Rewards World Elite and the Scotia Momentum Visa Infinite. The MBNA card offers 2% cash back on all purchases once the person converts their rewards into cash. The Scotia Momentum offers 4% cash back on gas and groceries and 2% on pharmacy purchases and recurring bills. Everywhere else is 1% cash back on all purchases. Those who spent around $2,000 a month usually saw cash back of $400 or more with these cards. While a person won’t save as much as they might with cash back, there can still be significant savings of $100 or more with a lower interest rate. The top two cards in these categories are the TD Emerald Visa which offers a max rate of 12.75% and the RBC RateAdvantage Visa which goes as high as 11.67% depending on the person’s credit score. The higher the credit score, the lower the interest rate will be on these cards. If a person prefers to shop at a certain store, they may want to look into a credit card canada that offers store rewards for a great way to save money. The Rogers First Rewards MasterCard offers over $400 in savings for those who subscribe to Rogers services while the Scotiabank Scene Visa offers points that can be redeemed for premium movies. People who have this card saw just under $400 in rewards when they spent $2,000 a month or more. For many people, the best credit card canada is going to offer travel rewards. The WestJet RBC World Elite MasterCard offers 2% on all travel booked through the airline plus additional benefits. Users could see over $600 in savings with this card. The American Express Gold Rewards is also one of the top contenders in this category and many people see over $500 in rewards when they spend $2,000 or more in a month. 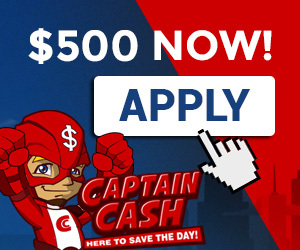 Instead of using services like captaincash to get extra money when it’s needed, a person can get the best credit card canada 2015 for their spending habits and start saving quite a bit of money. Over time, these savings can easily lead to a much larger savings account that allows them to cover all the smaller emergency expenses they might encounter. To get one of these credit cards and start saving money, go ahead and take a look at your credit score today. Find out how you can increase your score as much as possible to have a higher chance of being approved for one of the top cards to help you save more money.